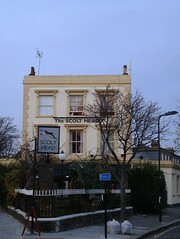 Pub in De Beauvoir Town in North London. It's made up of three separate areas, and there's also a patio-style beer garden out the front. The front part, around the bar, is quite small. There's a separate "sports room" to the left of the bar with a pool table, a large pull-down projection screen, a "Laser Disc" jukebox, and a couple of leather sofas and an armchair as well as upright wooden chairs and tables. Finally, there's a restaurant area to the right of the bar, which on our visit was laid with wine glasses and cutlery (and completely empty, as that part wasn't open yet). Decor is generally a bit gastro, with bare floorboards etc, but well-lit (unlike the Talbot down the road). Kake, Ewan, and Kat visited on a Thursday evening in November 2008. Real ales available were Summer Lightning (£2.90/pint), London Pride, and Deuchars IPA. Familiar lagers as well, including Leffe (£2.25/half pint) which they filled to the brim of the glass, well above the half-pint line. When Kake arrived around 5:15pm, the front bar was already quite lively, with several customers in, and there were also a couple of people playing pool in the pool room. Music was playing throughout our visit (a CD, despite the presence of a jukebox); not too annoyingly in general, though there were some very odd things going on with the volume control at one point. According to a blackboard seen outside in November 2008, lunch is served noon-3pm Mon-Fri and noon-4pm Sat-Sun, and their restaurant is open 6:30pm-10pm Mon-Sat and 6:30pm-9pm Sun. They also advertise Saturday brunch and Sunday roast. A sign in the ladies' (November 2008) said that quiz night is Monday from 8pm; £2 per person, 6 people per team maximum, cash and bar tab prizes. According to the 2009 Good Beer Guide, there's also a real open fire, a heated and covered smoking area, and live blues every other Thursday. Cyclists may be pleased to learn that there are some Sheffield stands (not under cover) on the pavement outside. Accessibility: Step down to get in, and the floor is a little uneven in places, but there is an accessible toilet (which seemed to be in working order on a quick peep). There's a step or two up to get into the pool room. Last visited by Kake, Ewan, and Kat, 21 November 2008. Opening times taken from the 2009 Good Beer Guide. Last edited 2013-05-10 08:00:27 (version 14; diff). List all versions. Page last edited 2013-05-10 08:00:27 (version 14).